When you swing the golf club you need to keep a solid and firm grip on the club to have any sort of golfing consistency and success. There are many different “ideas” on how hard you should grip the golf club, e.g. hold the grip as though you’re holding a baby bird OR hold the grip as tight as you would a loaf of bread etc., etc. But the bottom line really is not so much how hard you hold the grip but it’s how hard you don’t hold it. You see, in an ideal world you should hold the golf grip just hard enough so it doesn’t slip or move around when you swing. How hard that is will vary from golfer to golfer as we’re all different. If you have very strong hands then you may not need to hold the golf grip as hard as, say, an elderly lady. So the defining line on how hard to golf grip a club is by how much it moves and here’s a great way to determine your golf grip movement. 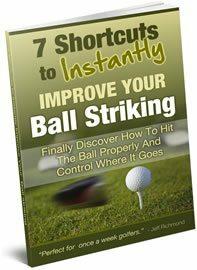 Line up 7 balls in a row on tees and then start at the first ball and hit it and don’t alter your golf grip and then hit the next ball and the next one. If you come to a point when you can’t hit the ball because your golf grip is nothing like it should be then you know that your golf grip has slipped when you’ve swung. If you can’t hit the second shot because of your grip movement then you’ve got a grip slippage problem that needs fixing fast. The main key to your grip slipping will most probably be due to your top hand moving. So here’s a simple exercise you can do to help fix this. Grip the golf club as normal. But just before you swing place a golf tee between the pad of your left hand and the golf grip. Now this golf tee should be securely in place by the pressure that you’re placing on the golf grip with your left hand. Once it is you simply need to swing as normal and keep the tee in place. Naturally this can only happen if you don’t move your top hand grip. And this will happen naturally just by you being aware of the golf tee and trying to keep it in place. 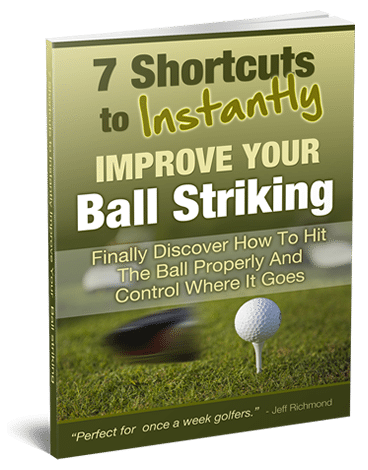 Then after some practice with this exercise go back and do the 7 ball exercise and see if you’ve improved your grip security. I’m sure you will find you have improved it. So try this golf grip drill and see for yourself.